Dr. Leang strongly believes that effective teaching and student learning starts first with engagement and excitement. For this reason, he has focused on integrating exciting and real-world applications into his instruction, followed by using project-based activities and the inquiry method to further enhance student learning. In many of his classes, he has developed open-ended design projects where teams of students work together and apply their engineering knowledge to solve an open-ended design problem. He also believes that a good teacher is one that is patient, and he works hard to give each student the opportunity to learn by constructing their own knowledge through exploration and experimentation. 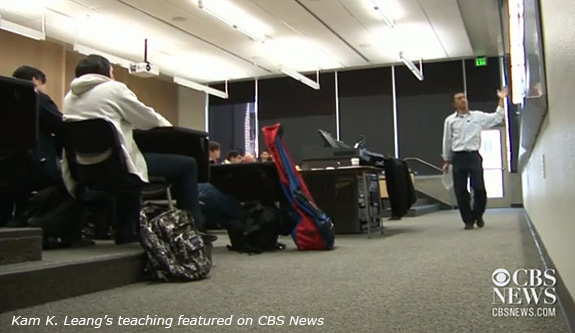 Dr. Leang featured on CBS News (national) related to unmanned autonomous systems work in Nevada, http://www.cbsnews.com/news/drone-degrees-universities-train-students-for-high-tech-future-of-flight/, February 28, 2014. Dr. Leang’s work on nanocomposites for damping snow skis featured on NSF’s website and NBC Learn, http://nbclearn.com/2014olympics/cuecard/68296, January 9, 2014. H. Fu and K. K. Leang, IEEE Cont. Syst. Mag., vol. 32, no. 4, pp. 95 – 97, 2012. K. K. Leang, IEEE Cont. Syst. Mag., vol. 32, no. 2, pp. 70 – 71, 2012. K. K. Leang, IEEE Cont. Syst. Mag., vol. 32, no. 1, pp. 66–68, 2012. IEEE Transactions on Education, vol. 53, no. 3, 372-383, 2010. ASEE Annual Conference and Exposition, Pittsburgh, PA, USA, June 22-25, 2008. ASME International Mechanical Engineering Congress and Exposition (IMECE), Seattle, WA, USA, November 11 – 15, 2007. “One-of-a-kind products designed by engineering students,” Story written by Mike Wolterbeek highlighting Dr. Leang’s ME 451 Capstone Design course projects, UNR News, December 20, 2010. “Nanotechnoloski: Reno Students Build Dream Skis,” Backcountry Ski Magazine, to appear in the August 2010 buyer’s guide issue. Story written by Erik Lambert covering the NSF NUE project that integrates nanotechnology and skiing for the ME undergraduate curriculum. Interview with Dr. Milton Glick discussing NSF NUE project: nanotechnology and skis, President Glick’s Radio Show, KUNR 88.7 (February 23, 2010). “Technology/Students conceptualize design, build skis,”Truckee Times, December 5, 2009. Story written by Skyler Dillon covering the NSF NUE project that integrates nanotechnology and skiing for the ME undergraduate curriculum. “Walkin’ in a winter nanoland,” Chemical & Engineering News, Vol. 88, No. 1, January 4, 2010. Story written by Lauren K. Wolf covering the NSF NUE project that integrates nanotechnology and skiing for the ME undergraduate curriculum. “Engineering big results from a small start,” National Science Teachers Association Monthly report, Vol. 21, No. 6, pp. 16. Story written by Lynn Petrinjak covering the NSF NUE project that integrates nanotechnology and skiing for the ME undergraduate curriculum. “Curriculum mixes nanotechnology and skiing,” Nevada Silver & Blue Magazine, pp. 102, Story written by Mike Wolterbeek covering the NSF NUE project that integrates nanotechnology and skiing for the ME undergraduate curriculum. (Spring 2010). “Nanotechnology meets skiing,” Story on the front page of www.unr.edu homepage (December 2009).